OVERVIEW: This guide provides four exercises to help you access a powerful psychological mindset called the beginner’s mind to elevate your creative work and enhance your ability to learn. How often do you get stuck in a pattern of doing the same things day after day? Do you frequently think the same thoughts? Maybe you ruminate on the same old storylines? Are haunted by indecision on the same problems? Do you hit up against the same resistance to getting something done? Consumed by various cognitive biases and limiting belief systems, your range of possibilities can quickly shrink to a restrictive few. In this state, you have virtually no creativity to access. Even though you may not realize it, your world gets relatively small. Why is this phenomenon common and what can you do to break this pattern? In his popular TED Talk, Do Schools Kill Creativity? as well as his Changing Education Paradigms, creativity expert Sir Ken Robinson sheds light on a primary source of our crisis in creativity. Robinson explains that divergent thinking—the ability to see many possible answers to a question—is a fundamental attribute of creativity. One way researchers evaluate divergent thinking in individuals is by the number of answers they give to questions like, How many uses are there for a shoe? Or how many uses can you think of for a paper clip? Most people might offer 10 to 15 answers; others can divine closer to 200. Psychologists classify these latter folks as geniuses at divergent thinking. In a study, 1,500 participants received these types of questions. All of the participants were around five-year-olds. How many of them scored at the genius level? The researchers tracked these same students fives years later. Now, only 32 percent scored as high. Then, another five years later, now at age 15, only 10 percent reached the genius level. Approximately 200,000 adults took the same test. How many scored at the genius level? A paltry 2 percent. This research is a wake-up call for those of us who have children, but what about you? What can you as an adult do to bring back the innate genius? Robinson attributes this alarming drop in genius over a 10-year period to the “educating” process. There is one answer to a problem, the system instructed us. And, we recite that one answer in class and on examinations. To make matters worse, we were often humiliated when we didn’t know their one answer. This “educating” process conditioned us with what psychologists call functional fixedness—looking at a problem from a familiar viewpoint. With functional fixedness, it’s as if a mental block hinders our ability to consider new ways of looking at things. A student comes to a famous Zen master and asks for instruction in the way of Zen Buddhism. The master then invites the student to have some tea. When the tea is ready, the master pours the tea into a teacup, filling it to the brim, spilling tea over the sides of the cup and onto the table. 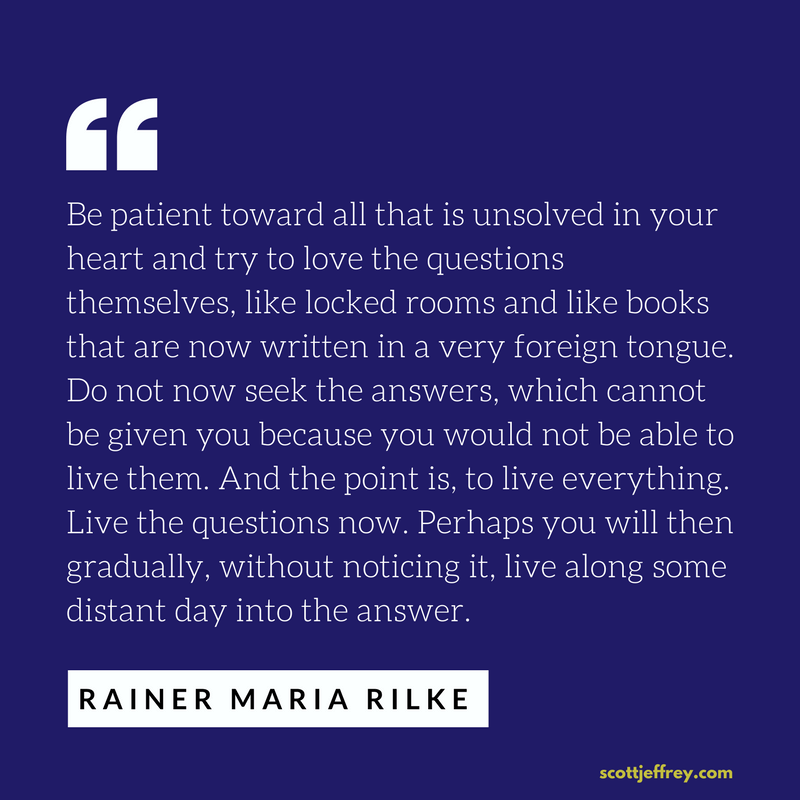 While as young children we naturally “live the questions,” as poet Rainer Maria Rilke wrote, as adults we’ve come to assume the answers. Filled with endless bits of information, we find it difficult to sit with the ambiguity of not knowing. The “I know” syndrome plagues us, hindering the impulse for curiosity. And curiosity is a precursor to creativity. The solution to the “I know” pattern—the mind of the so-called expert—is to adopt what’s called in Zen Buddhism a beginner’s mind. 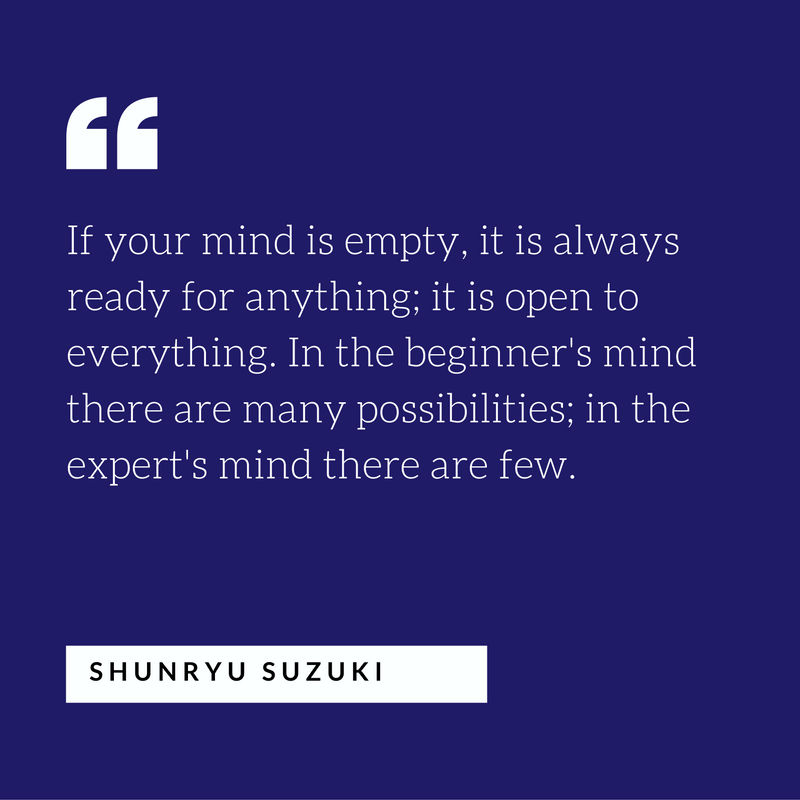 A beginner’s mind is empty. That is, it holds no preconceived ideas or rules about what is. It is open, eager, and receptive. This is another characteristic of a Master. Whatever he does, he does with the enthusiasm of doing it for the first time. This is the source of his unlimited energy. Every lesson that he teaches (or learns) is a first lesson. Every dance that he dances, he dances for the first time. It is always new, personal and alive. In his study of creative people, Abraham Maslow found that in moments of absorption, they describe a kind of innocence akin to the beginner’s mind. They are variously described as being naked in the situation, guileless … without “shoulds” or “oughts,” without fashions, fads, dogmas, habits, or other pictures-in-the-head of what is proper, normal, “right,” as being ready to receive whatever happens to be the case without surprise, shock, indignation, or denial. In moments of creativity and absorption in what we’re doing, individuals adopt a beginner’s mind. Psychologist Mihaly Csikszentmihalyi calls this state flow. One prerequisite for originality is clearly that a person shall not be inclined to impose his preconceptions on the fact as he sees them. Rather, he must be able to learn something new, even if this means that the ideas and notions that are comfortable or dear to him may be overturned. When you first learn something new, like a way of stretching your shoulders, your mind is engaged in the task. But how about after performing the stretch five or six times? After each experience doing the stretch, the freshness wanes a little more. Novelty erodes quickly. But with renewed freshness, the mind stays open. It enables the individual to maintain their original attitude toward something that has already become familiar. In last week’s article on the creative process, I pointed out that the beginner’s mind is a prerequisite of the Student archetype. Remember that a beginner’s mind is your mind’s natural state. Beginner’s mind isn’t something difficult to attain or something that takes years of practice to experience. Such beliefs only make something simple feel elusive. You can’t “achieve” a beginner’s mind, nor can you “try” to be open and ready. Trying only create internal tension. You can only strip away everything in the way of experiencing this natural state, emptying the teacup so that new perspectives and ideas can emerge. To return to a beginner’s mind, find a way of calming and quieting your mental chatter. Below are four useful methods to help empty your mind. Experiment with them and see what works best for you. Bring your awareness to your breath. Focus your attention on the process of inhaling and exhale, place your awareness on a particular location like your navel as you inhale. Or notice the feeling of the air entering your nostrils. The main idea is to focus your attention on a single action in a particular location. Doing so draws your energy to this area thereby quieting your mind. Sitting or standing, place both your feet firmly on the ground. Put your full awareness on the bottom of your feet. Feel your rootedness. Notice any sensations you feel in your feet. I find this to be one of the fastest methods for quieting my mind. Keeping our attention exclusively on our thoughts is normal for most of us. It’s as if we have an excess amount of energy swimming around in our heads, keeping us fixated on thinking. When I place my attention on my feet, within seconds, I notice a shift in this energy. My mind becomes quieter and I feel more centered. Gaze at an object for a period. Strip away the name of what you call that object. For example, “pen.” If you didn’t know that a pen was called a pen or that it was for writing, how would you experience this object? Notice the form, shape, texture, color, etc. without judgment of the object. If you do this for long enough, the object may become foreign to you. Then, you will experience a ping of curiosity, followed by the thought, “What is that?” This curiosity is a trademark of beginner’s mind. Drop all of your false identities about yourself. For example, I am a Democrat, a vegetarian, an athlete, an achiever, a mother, father, sister, husband, etc. Every label you have for yourself comes with a host of beliefs associated with that label. Each label activates an archetype in our minds, meaning they trigger set patterns of behavior that prohibit openness. In a beginner’s mind, you’re empty. That is, no labels qualify. Let go of who you think you are … if only for a few precious moments. Although the beginner’s mind is natural, over the course of living, you tend to lose this natural quality of consciousness. Now, to return to this natural state, you need to install a new pattern. The above exercises can help. Use them whenever you want to open up to new possibilities. Experiment with them before you start working on a project or brainstorming with others. It’s also helpful when you’re wrestling with a difficult decision. Remind yourself that whatever you currently see―whatever is known to you at present―is only a perspective. There are many other equally valid perspectives too. In returning to the mindset of the beginner, you open up to worlds of new ideas and possibilities.